The marks of an erasure on pavement are signs of violent acts. Its "impressions" are like traumas on the body and mind, left by an accident. The graphic theme of a scar, born of violence, is that brought together by challenges, and is accusatory by nature. Luis Camnitzer (Uruguay), for example, presents his "Agente Naranja" (Agent Orange), a classic of twentieth century Latin American art. It consists of a series of photo etchings, assembled into a narrative sequence of texts and images expressing the havoc wreaked by the use of this poison in the North American war in Vietnam. The work Landmark: footprint, by Allora and Calzadilla (Puerto Rico), serves as a record of the protests against naval practices in Vieques, by means of a group of photos recording protesters’ steps in the sand of the beach. In both cases, we can speak of a second degree or "squared" graphic, in a manner of speaking, but in an inverse sense. While Camnitzer carries the photo to the engraving in order to codify it with texts, (Barthes warns that a photo is an uncodified sign), the Borinquen duo’s work is based on ephemeral prints (left by the soles of shoes which act as matrices), which they then document with a photograph. Other artists work on the narrative of history, particularly armed conflict, utilizing formats which revert to the comic strip (Luis Garcí­a Zapatero, from Peru), the indigenous codices (Ernesto Chagoya, from Mexico) and the In Memoriam column (José Antonio Suárez, from Colombia). In fact, war becomes a "Correspondencia" established by the curators between the prints from Paraguayan newspapers (El Centinela, Cabichuí­, Cacique Lambaré and Lambaré),which acted as an ideological battlefront in the midst of the Paraguayan War (1867-68), and works in linoleum by Carlos Raquel Rivera (Puerto Rico), laden with denouncements against the colonial status of the Island. Lastly, Antonio Martorell exhibits the Scorpion Packs, a game of cards, in which four opposing political parties are ridiculed. These packs show the intervening marks left by FBI agents who dusted for fingerprints when they raided the artist’s house in 1985. This search for evidence itself became the evidence of a violation of the right to free artistic expression. If we take another route we reach one of the most dynamic axis of the Triennial, that of Insertos, consisting of works that recover the vocation of the print through distribution and circulation in public space, either by posters, publications or the Internet. Repeating the counterpoint formula, Tangrama (Colombia) has been selected to repair the walls of the city that have been saturated by political posters and Daniel J. Martinez (U.S.A.) to distribute cards that resemble pages from a poetry book. Tangrama literally creates a "graft" since they (Margarita Garcia and Monica Paez) restore the walls with photographic wall reproductions. Their intervention emulates the cosmetic surgery the authorities are enforcing with the goal of keeping the city "clean". For his part, Martinez makes posters such as those announcing salsa concerts in Los Angeles. They are pure typography and color, but summarize part of the popular urban aesthetic. He places them on the floor of the gallery in identical piles for the spectator to take away. In the end, they work as a kind of public poll, since the differences in the heights of the stacks reveal certain preferences activated. 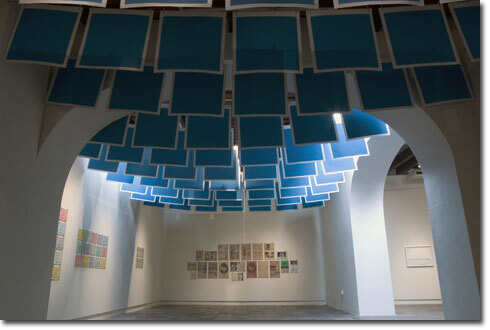 A different sort of historical insertion is achieved with the assemblage of "Popular Etchings", a newspaper intervention by Alvaro Barrios (Colombia) and the documentation of work carried out by Félix González Torres in Puerto Rico (1978-1988). In both cases the artists utilize mass distribution as the point of departure for the potential democratization of art. The document González Torres entitled "La imagen como producto/poder" (The image as product/power) shows that as early as 1981 he had defined some of the objectives of his poetics that later achieve maturity in New York.